Tired of Graph tree reordering? One of the most annoying CATIA features when you work with large assemblies is reordering of specification tree in Products. Although built-in function for tree reordering is far from being flexible or effective, as a user you just do not have another option. Even as a programmer and this is quite surprising, there is no direct way of reordering components in specification tree. Hopefully it will change in the future, but such a function has not been exposed to CATIA API yet. One known workaround is to use some CUT & PASTE operations but this could be an option perhaps when you work with small assemblies. For large ones you definitely need something stronger. Why? Because CUT & PASTE operations switch components automatically into Design mode which significantly slows down CATIA performance and such a behavior is just not desired when you work with large assemblies. What's worse during CUT & PASTE process you are breaking links (drawing links, constraints). Do not expect miracles or some hidden CATIA secrets, our application is not even "SMART" :). It uses brute-force approach and built-in CATIA tree reordering function and it just simulates user input. This way you preserve all links and there is no need to switch into Design mode. Initial Order (left one): it is filled when you start an application and it reflects current order of components within active CATIA assembly. New Order (right one): requested order. With left & right arrow buttons you can move items between left and right listbox, with up & down buttons you move items within right listbox. Multiple selection is supported. A - Z, Z – A buttons sort an order in right listbox ascending / descending. Reload button reloads items from active CATIA assembly to the left listbox and clear the right one. Reorder button starts reordering of active catia assembly according New Order listbox. 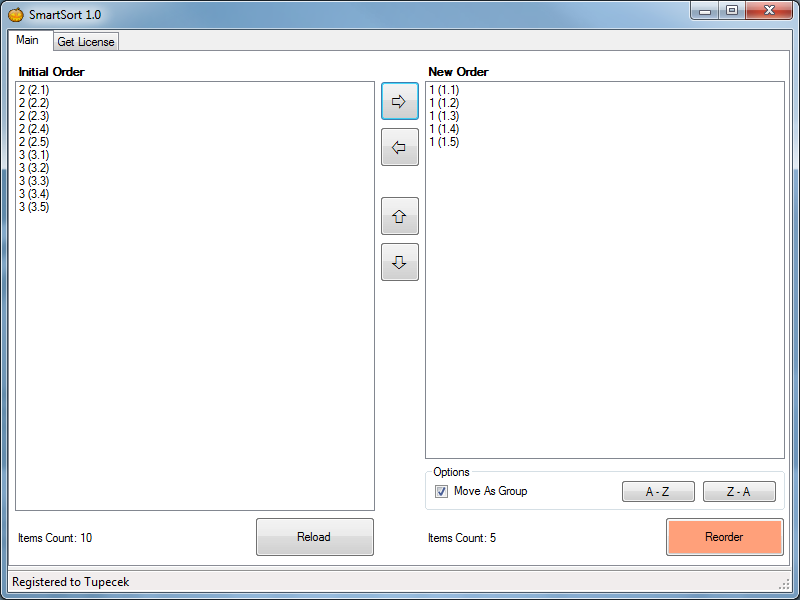 User interface is really simple, all you have to do is copy items from "Initial Order" listbox to "New Order" listbox and press Reorder button. User interface is very simple. 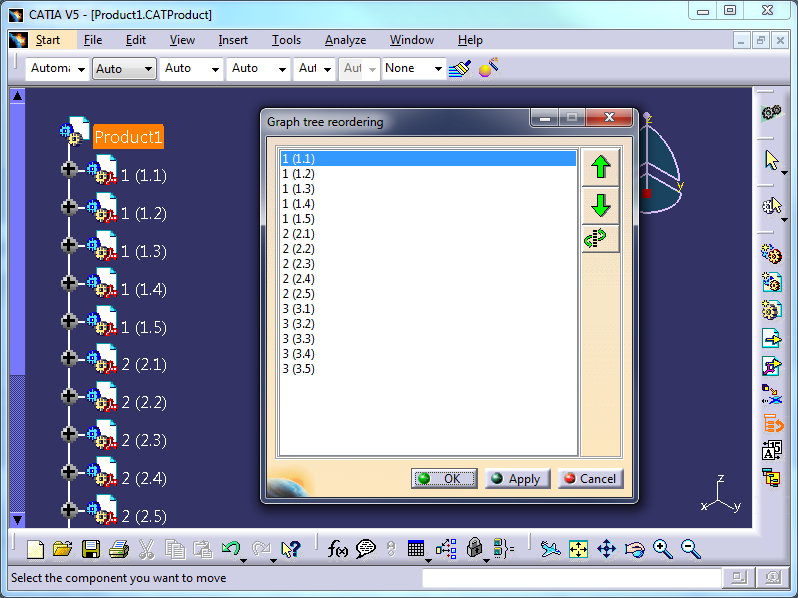 Application uses CATIA native Graph tree reordering function. If you like / dislike any of our applications, your constructive feedback is always welcomed. Please leave your comment or suggestion and help us with future development. Now, go ahead, Your Opinion Matters! Thanks for the application ! It work great but i can’t manage to get it work when when i’m inside a component it simply doesn’t recognize it. It there something i’m missing ? Well, application works only at the top level of your assembly. The only solution is to open your sub assembly in new window, press Reload button and reorder it as you need. However, CATIA command Open in a New Window works only for Products, not for Components. I’d like to be able to run SmartSort from a macro but all the examples I’ve found throws an error. Is there a way? Awesome program by the way! I would like to help you, but I am not sure what are you looking for. Could you please give me a better description of what do you want to achieve? Which are the requirements to use this aplication? I think this has something to do with your company policy or antivirus software. It looks like the application was somehow detected as a threat and put into the vault. The application itself requires Microsoft .NET Framework which is probably part of your system already (if not you can download it from Microsoft website) and proper CATIA V5 installation. something like this is very likely. An application is just a big hack around Windows API and CATIA user interface and it just simulates user input. In order to identify Graph tree reordering window and its children (components like buttons and lists), it is searching for them by name e.g. “Graph tree reordering” for the window, “OK”, “Apply”, “Cancel” for buttons and so on. The application has been tested only under V5R21 English version. In case that you are using different language version of CATIA than English or one or more components are named differently (which could be a case of V5R26), the whole process of components identification will fail. I am sorry for that, but I have no chance to test it in higher releases of CATIA and application is for the time being compatible only with English language version.